ECHINODERMATA : OPHIURIDA : Amphiuridae STARFISH, SEA URCHINS, ETC. Description: A small brittle star with long coiled arms which lives buried in coarse gravel. This is a very inconspicuous species; the arms are usually red-brown in colour and often blend well with the substratum. The dorsal and ventral surfaces of the disc are naked apart from the radial shields on the dorsal surface. The 3-4 arm spines are all strongly flattened and the second from below is axe-shaped and widened at the tip. Disc 5-8mm., arms 12-15x disc diameter. 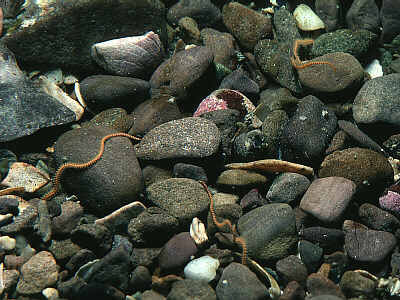 Habitat: This brittle star burrows in coarse gravel or shell gravel. The arms are extended onto the surface and are the only part of the animal visible. Often associated with Neopentadactyla mixta. Distribution: Western and south-western coasts of the British Isles and Irish Sea, rarely recorded. Similar Species: This is the only small brittle star likely to be encountered in coarse sediments, it may be found with Ophiopsila annulosa. Amphiura incana has recently been discovered in crevices in limestone rock in Galway Bay. It has 2 tentacle scales, scales on both sides of the disc and 7-10 flattened arm spines. Small disc and very long coiled arms. Upper and underside of disc naked apart from radial shields. Single tentacle scale, minute, absent in distal part of arm. Picton, B.E. & Morrow, C.C. (2016). Amphiura securigera (Duben & Koren, 1844). [In] Encyclopedia of Marine Life of Britain and Ireland.